New Zealand have always pushed the boundaries with interesting and out-there advertising. I can think of a couple of examples. Last year’s police recruiting ad, or this golden oldie from L&P from 2006 that you really have to watch to believe! Yes you won’t be disappointed by watching both. And now, Air New Zealand have done it again. They are always trying to outdo themselves and this is their 18th take on safety videos. They usually use OS talent, but this time it’s all local. Their creative Ad agency must have so much fun pitching crazy ideas. Every year AirNZ’s safety and Christmas ads are always worth looking forward to. And this year is no different. My next blog post will be on the Xmas ads! In a 600 strong cast, ‘It’s Kiwi Time’ takes the classic song, Tricky as it’s base for their safety video, which really is a music video disguised as a safety video. This song dates back to the late 80’s which means that many people may hear the song and be enticed to watch the video out of interest. A new target market I hear you say? And while some people are saying, ‘what happened in the 80’s should have been left in the 80s’, most viewers are hailing it as another success story for AirNZ. You can watch it on YouTube by clicking here. What do you think? Yes, it is long, but it is entertaining, and just as you would expect from this creative company. Air New Zealand really put their key stakeholders at the centre of their campaigns. Mostly it’s their staff (cabin crew, engineers etc), but this ad sees a lot of thought go into it by using various destinations from around the country, and using singers, dancers and talent from 30 community groups. Air NZ have been proud of who they are and their country and locally grown talent, and it shows. You would be proud to be a staff member, or a shareholder. Or a passenger. It’s another aspect of marketing that often gets lost. AirNZ are all about relationships. They want one with you, and once they get your attention, you want to find out more. Just like I do every year when I write my Xmas blog post, as I look forward to their ads! You can read my AirNZ 2017 Xmas ad review here and watch the campaign. And if you head over to @FlyAirNZ twitter account, you can read the love coming in for the new ad. Also it’s great to see that AirNZ have a great social media team who actually respond to posts. In previous years, The All Blacks have always been a feature of the airline’s TVCs and YouTube ads, this one is a take off of Men In Black back in 2015, and if you have a spare 5 minutes (yes it reads long, but it is worth your time) click here to watch it. With the runaway success of The Lord of The Rings, AirNZ played on New Zealand being the home of Middle Earth. This meant a lot of safety videos featured cameos of many of the actors, AirNZ staff and the famous Director himself, Peter Jackson. Humour was always central to these videos. But also awesome scenery! 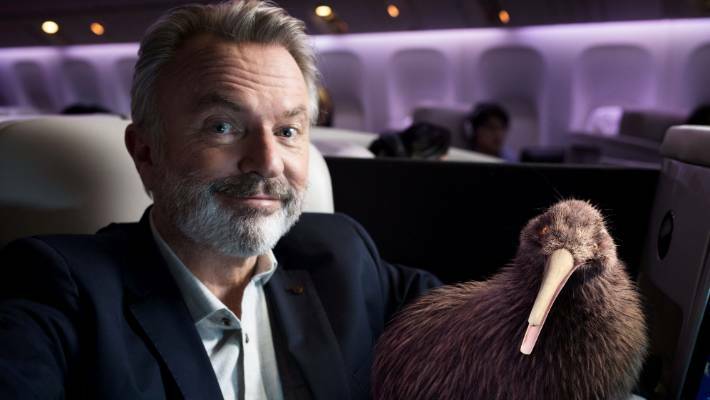 More recently, they have used talking and loveable animals, Dave the Goose (voice by Aussie actor Bryan Brown) and Pete the Kiwi. Pete’s voice is from another loveable Kiwi, Sam Neill (pictured below). Enjoy!